Thermal Imaging Market size was estimated at over USD 5.5 billion in 2017, with around 8% CAGR estimation from 2018 to 2024. The global shipments are forecast to reach over 4 million units by 2024. Increased adoption in machine vision-based applications across the industrial segment and demand for enhanced perimeter security across residential applications will further fuel the thermal imaging market demand. However, the high cost of devices such as cooled cameras, which offer better resolution and export restrictions imposed on the sale of thermal images outside the U.S. due to concerns over the misuse for terrorist activities may hinder the thermal imaging market growth. The fixed/mounted cores segment in the thermal imaging market is expected to grow at a CAGR of 10% from 2018 to 2024. The cores have witnessed a mass adoption owing to their low-cost, compactness, and flexibility to integrate with other handheld devices such as smartphones, tablets, drones, and wearables, thereby enabling them to penetrate across new application verticals. Technological advancements have been aimed toward the miniaturization of cores, making them lightweight and less power consuming. In 2018, Leonardo DRS announced the launch of its smallest 10-micron uncooled thermal camera core for OEMs. Such miniaturized camera cores can be used by OEMs in their customized product offering, resulting in the increased revenue growth of the global thermal imaging market. The demand for integration of cores with smartphones has enabled several users to diagnose and detect electrical and mechanical faults using their handheld devices. The uncooled thermal imaging market valued at USD 2.5 billion is expected to grow substantially by 2024. Developments in the uncooled technology coupled with the availability of low-cost cameras have led to the commercialization of such products, which was predominantly required by military and defense applications. The demand for uncooled technology can be attributed to the rising penetration in applications such as residential security, industrial imaging, and personal vision systems. Improvements in the Uncooled Focal Plane Arrays (UFPA) are targeted toward higher pixel density and sensitivity. In February 2018, Teledyne Dalsa announced the initiation of its fabrication process for Wafer-Level-Packaged Vanadium Oxide (VOx) microbolometers for long-range infrared (LWIR) imaging. The price competitiveness for uncooled imagers has also been intensified by regional vendors offering low-cost solutions. Some of the major vendors in the uncooled thermal imaging market are FLIR Systems, Seek Thermal, BAE Systems, and Leonardo DRS. Thermal imaging market is witnessing a rising adoption in the automotive industry and is expected to reach over USD 900 million by 2024, particularly in the Advanced Driver-Assistance Systems (ADAS). Such camera systems enable vision under low-light conditions and help in improving driver awareness and prevention of impending risks. According to the National Highway Traffic Administration System (NHTSA), in the U.S., 5,376 pedestrians were killed in traffic crashes mostly in the night or low-light conditions in 2015. 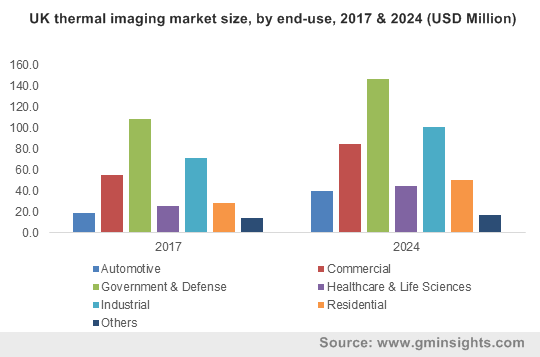 The development of self-driving and autonomous cars is anticipated to offer the potential for growth of the automotive thermal imaging market. Furthermore, the residential segment in thermal imaging market will witness robust demand across surveillance applications for perimeter security and tracking due to the growing popularity of smart home automation solutions and the rising rate of home-related crimes and burglaries. Furthermore, the demand for handheld imagers related to building diagnostics and inspection has shown a steady growth owing to the non-invasive, cost-effective and reduced time-consuming investigations performed by such devices. Thus, the technology is used extensively in the inspection of building insulation, detection of moisture in ceilings, walls, or roofs, conducting energy audits, and plumbing leaks or blockages. Security & surveillance applications accounted for over 30% revenue share in the thermal imaging market in 2017 due to the surge in demand for thermography cameras across commercial and residential end-users for perimeter security, intrusion detection, and tracking. Such camera solutions are used by border patrol during low-light and nighttime conditions enabling security teams to reduce the cost of surveillance and security systems with a low rate of false alarms. Over the past few years, the thermal imaging market has witnessed a strong growth in critical and government infrastructure surveillance applications but with price erosion and the development of low-cost IR sensors, the segment is expected to register a strong growth over the forecast period. The use of thermal imagers for monitoring and inspection enables end users to monitor structural health, machine condition, insulation condition, pipeline inspection, HVAC, and quality assessment, among other uses. In addition, emerging applications of thermography in agricultural monitoring are expected to drive thermal imaging market growth over the forecast period. Thermal camera fitted drones enable farmers to scout cattle and monitor crops. In January 2015, the Federal Aviation Administration granted the permission to fly drones for crop surveillance in Washington, U.S. thereby offering an impetus for the growth of the thermal imaging market. The North American region is likely to dominate the thermal imaging market; it accounted for over 35% of the revenue share in 2017. Increasing adoption across home automation and commercial applications coupled with the growing demand for smartphone-based dongles is expected to drive the thermal imaging market growth in the region. The U.S. Army can be attributed as an early adopter and eminent enabler of the technology awareness among the various application segments. Export restrictions related to thermal imaging products may hinder growth in North America. The presence of several prominent vendors in the U.S. including FLIR Systems, Raytheon, Fortive (Fluke Corporation), L3 Technologies, etc., and the strong demand from the military in the country can be factored as a key growth driver for the thermal imaging market in the U.S. The global thermal imaging market is consolidated in nature with major vendors accounting for over 50% share in 2017. The need for specialist technological expertise, high capital investments, and the critical nature of deployment in military operations make it difficult for new entrants to establish a strong foothold. However, with the development of alternative uses of thermal imagery, such as smartphone integration, UAV, and drone integration, start-ups in the field, have leveraged the new application segments to provide diverse product offerings in the thermal imaging market. 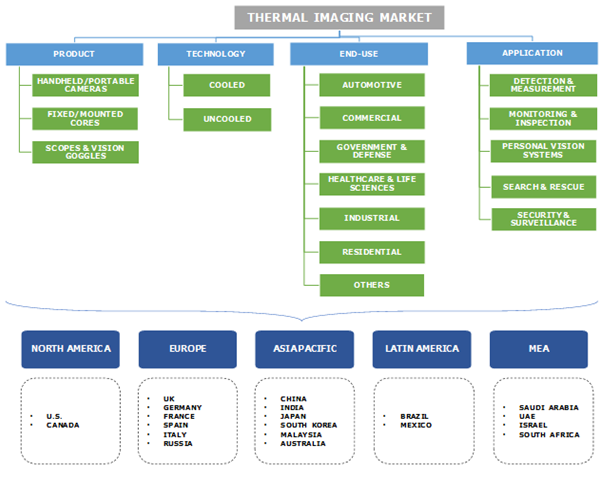 Acquisitions that focus on vertical integration and strategic partnerships for regional presence serve as key strategies followed by vendors to enhance their thermal imaging market share across diverse regions. The players have been focusing on the global deployment, integration of new technologies, and offering of smart products, while minimizing the production cost and time, improving product development cycles, enhancing customer service, and controlling production inputs through vertically-integrated operations. Some of the key vendors identified in the thermal imaging market include FLIR System, BAE Systems Imaging Solution, Leonardo DRS, L-3 Technologies, Raytheon, Seek Thermal, ULIS (Sofradir), Testo SE, and Fluke Corporation, among others. Development of microbolometer technology has led to the reduction in prices of thermal cameras thereby leading toward the commercialization of infrared imagers. The continuous growth in infrastructural development projects along with surging demand for city surveillance to combat crimes is expected to fuel thermal imaging market growth over the forecast period. The decline in military spending and defense budgets across developed regions such as the UK, the U.S., Canada, and France may impose pitfalls for the thermal imaging market growth. However, surging demand across non-government applications, such as personal vision systems, automotive night vision, and smart home solutions, to offer potential avenues for the industry growth. The low adoption rate in certain application segments and lack of awareness act as major pitfalls for the thermal imaging market growth. The capability of such imagers to identify temperature differences make them suitable for diverse applications such as automotive, aerospace, and healthcare, among others.